Corsair LL140 RGB Computer case Fan. Made for those seeking excellent airflow, quiet operation, and powerful lighting, the CORSAIR LL140 RGB fan puts your PC back in the loop. The included CORSAIR Lighting Node PRO enables stunning dynamic lighting effects with other CORSAIR LINK supported devices. Corsair Air CO-9050083-WW Computer case Fan. THE BEST OF AIRFLOW AND STATIC PRESSURE. Up to 52 CFM of airflow at peak 1400 RPM. HIGH AIRFLOW. Maximum airflow 52 cfm. An opaque fan blade diffuses lighting to ensure stunning LED illumination. Corsair Air CO-9050082-WW Computer case Fan. DIFFUSED LED ILLUMINATION. An opaque fan blade diffuses lighting to ensure stunning LED illumination. Illumination colour White. Product colour Black,White. Corsair Air ML140 Pro Computer case Fan. ML140 Pro, 1600 RPM, 140 x 25mm, Black. Highlights Corsair is expanding its range of fans with the introduction of the ML series, an acronym that reveals the technological nature of the new series of magnetic levitation fans. Corsair Air ML140 Computer case Fan. Highlights Corsair is expanding its range of fans with the introduction of the ML series, an acronym that reveals the technological nature of the new series of magnetic levitation fans. Corsair Air ML120 Computer case Fan. Highlights Corsair is expanding its range of fans with the introduction of the ML series, an acronym that reveals the technological nature of the new series of magnetic levitation fans. Corsair Air AF120 Computer case Fan. Highlights Corsair Air Series LED high airflow PC case fans combine efficient, low-noise airflow with striking LED lighting. The blades are custom-molded for optimal airflow, and they’re ultra-thin for less noise and turbulence. Corsair Air AF140 Computer case Fan. Air Series AF140 LED Blue Quiet Edition - 140mm x 25mm, 25.5 dBA, 66.4 CFM, 0.8 mm/H2O, 1200 RPM. Highlights Corsair Air Series LED high airflow PC case fans combine efficient, low-noise airflow with striking LED lighting. Corsair Air AF120 Computer case Fan. Air Series AF120 LED White Quiet Edition - 120mm x 25mm, 25.2 dBA, 52.19 CFM, 0.75 mm/H2O, 1500 RPM. Highlights Corsair Air Series LED high airflow PC case fans combine efficient, low-noise airflow with striking LED lighting. Corsair Air AF120 Computer case Fan. Air Series AF120 LED Red Quiet Edition - 120mm x 25mm, 25.2 dBA, 52.19 CFM, 0.75 mm/H2O, 1500 RPM. Highlights Corsair Air Series LED high airflow PC case fans combine efficient, low-noise airflow with striking LED lighting. Corsair Air CO-9050086-WW Computer case Fan. HighlightsDIFFUSED LED ILLUMINATION. An opaque fan blade diffuses lighting to ensure stunning LED illumination. Illumination colour Red. Product colour Black,White. Corsair CO-9050090-WW Computer case Fan. DIFFUSED LED ILLUMINATION. An opaque fan blade diffuses lighting to ensure stunning LED illumination. Illumination colour Blue. Illumination LED. Rotational speed (max) 1150 RPM. Corsair CO-9050088-WW Computer case Fan. HighlightsDIFFUSED LED ILLUMINATION. An opaque fan blade diffuses lighting to ensure stunning LED illumination. Illumination colour White. Product colour Black,White. Corsair LL140 RGB Computer case Fan. Made for those seeking excellent airflow, quiet operation, and powerful lighting, the CORSAIR LL140 RGB fan puts your PC back in the loop. This product is intended as an expansion of the LL140 RGB LED 2 fan kit with Lighting Node PRO. Corsair ML140 PRO Computer case Fan. The RGB functionality of ML140 PRO RGB requires an RGB lighting hub and Lighting Node PRO. Four hub-mounted RGB LEDs output a vivid blast of light and color, making it easy to match your system’s style. Corsair Air AF120 LED Computer case Cooler. HighlightsDIFFUSED LED ILLUMINATION. An opaque fan blade diffuses lighting to ensure stunning LED illumination. Illumination colour White. Illumination LED. Corsair LL120 RGB Computer case Fan. Made for those seeking excellent airflow, quiet operation, and powerful lighting, the CORSAIR LL120 RGB fan puts your PC back in the loop. The included CORSAIR Lighting Node PRO enables stunning dynamic lighting effects with other CORSAIR LINK supported devices. Corsair ML120 PRO Computer case Fan. The RGB functionality of ML120 PRO RGB requires an RGB lighting hub and Lighting Node PRO. Four hub-mounted RGB LEDs output a vivid blast of light and color, making it easy to match your system’s style. 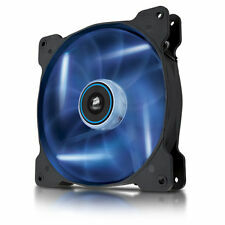 Corsair CO-9050040-WW - ML120 12cm Pro PWM Case Fan 12cm Magnetic Levitation Bearing Low Noise 5 Year Warranty. Corsair Air ML120 Pro Computer case Fan. Air Series ML120 Pro. Highlights Corsair is expanding its range of fans with the introduction of the ML series, an acronym that reveals the technological nature of the new series of magnetic levitation fans. Corsair Air ML120 Pro Computer case Fan. Air Series ML120 Pro. 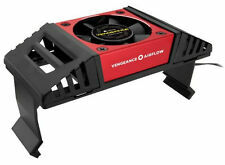 Highlights Corsair is expanding its range of fans with the introduction of the ML series, an acronym that reveals the technological nature of the new series of magnetic levitation fans. 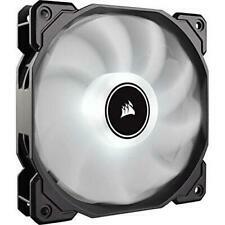 Corsair CO-9050091-WW - LL120 12cm PWM RGB Case Fan 16 LED RGB Dual Light Loop Hydraulic Bearing White. Create dazzling lighting patterns and effects with powerful CORSAIR iCUE software, bringing your system to life with dynamic RGB lighting synchronized across all your iCUE compatible products. Corsair LL120 RGB Computer case Fan. Made for those seeking excellent airflow, quiet operation, and powerful lighting, the CORSAIR LL120 RGB fan puts your PC back in the loop. This product is intended as an expansion of the LL120 RGB LED 3 fan kit with Lighting Node PRO. Corsair CO-9050084-WW Computer case Fan. Illumination colour Blue. Illumination LED. Depth 25 mm. Rotational speed (max) 1400 RPM. Noise level (high speed) 26 dB. Suitable for Computer case. Maximum air pressure 1.45 mmH2O. Corsair CO-9050089-WW Computer case Fan. DIFFUSED LED ILLUMINATION. An opaque fan blade diffuses lighting to ensure stunning LED illumination. Illumination colour Red. Product colour Black,White. Illumination LED. Corsair Air AF140 Computer case Cooler. 140mm x 25mm, 7V - 12V, 0.30 A, 1150 /- 10% RPM, 26 dBA, 1.43 mmH2O, 62 CFM. THE BEST OF AIRFLOW AND STATIC PRESSURE. Up to 62 CFM of airflow at peak 1,150 RPM. HighlightsDIFFUSED LED ILLUMINATION. An opaque fan blade diffuses lighting to ensure stunning LED illumination. Illumination colour White. Illumination LED. Rotational speed (min) 1035 RPM. Rotational speed (max) 1265 RPM.